Never again will you be at a loss with what to do with Daikon Radish after you explore and wade through this compilation of ideas and delicious recipes to attempt. Daikon means “Large Root” in Japanese. Which pretty much sums it up. Everything Daikon! Let me count the ways you can enjoy eating it…Daikon may very well become a staple favourite in your home kitchen once you learn how many numerous ways this low-calorie, nutrient rich vegetable can be eaten. The white tuber even aids in digestion. So grab your knife and show off your culinary cutting skills for dinner tonight or your next family get together. Enjoy! Get ready to get creative! Daikon is an extremely versatile vegetable that can be eaten raw in salads or cut into strips or chips. It also can be stir-fried, grilled, baked, boiled and broiled. 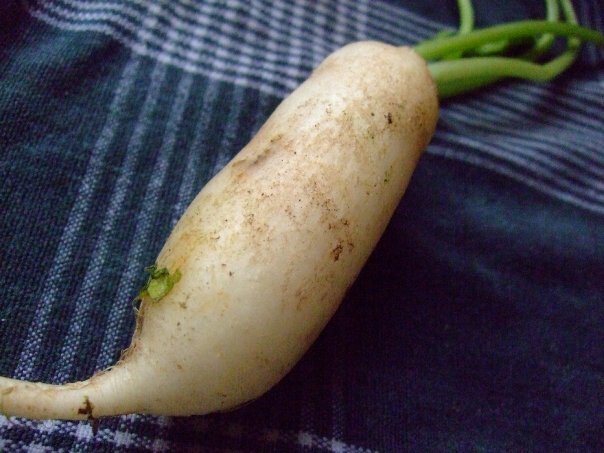 Use the daikon as you would a radish. It may be served raw in salads or grated for use as a condiment pickled, or simmered in a soup. They are also preserved by salting as in making sauerkraut. 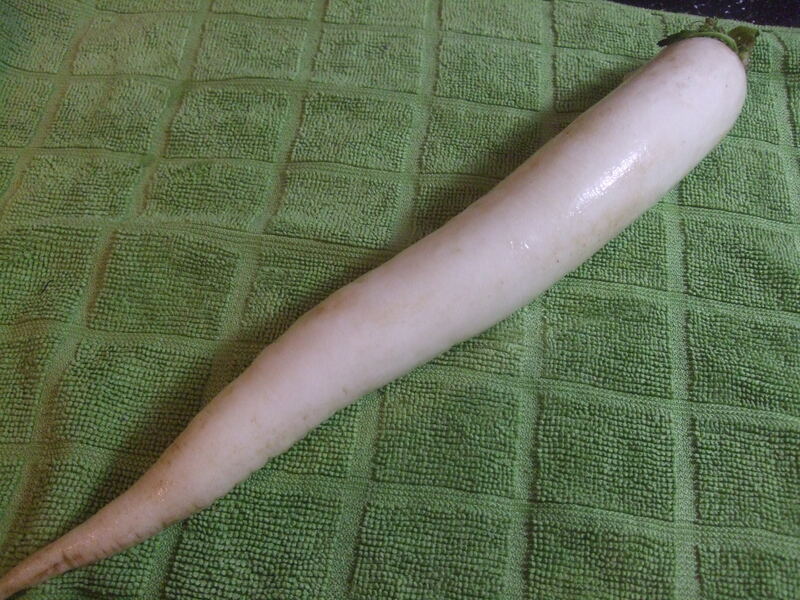 Daikon also is used in soups and simmered dishes. To prepare, peel skin as you would a carrot and cut for whatever style your recipe idea calls for. Not only is the root eaten, but the leaves also are rich in vitamin C, beta carotene, calcium, and iron, so they are worth using instead of discarding. Going Gluten Free? This is the BEST TIP For Chips or Crackers on vegetable trays or stir-frys – Simply peel Daikon with a vegetable peeler and cut crossways for thin chips. Dip thin chips in ice water and they will crisp and curl for a Daikon chip platter with your favourite cream cheese, sour cream, spinach or yogurt dip. Cut into Julienne strips for relish trays, salads or stir-frys. You will enjoy these crispy savory pancakes. They are a unique and tasty way to enjoy daikon radish. This yummy side dish is sort of a modified latke. If you like spiciness and the slight bitter taste of radish, you’ll love this recipe. Have them with ketchup or sour cream. Pour oil into a large skillet. Heat over medium heat. Fry patties in the hot oil until firm and nicely brown on both sides, about 3 minutes per side. Drain on paper towels. This recipe makes as much or as little slaw as you need. Make this for your next potluck or picnic. Salt lightly and let sit 5 minutes, then squeeze out. Heat rice vinegar, sugar and salt to dissolve, then cool to room temperature before use. Pour over daikon and carrots mixed in a bowl. Let salad stand at least 30 minutes before serving; will keep up to 3 days if refrigerated. Shred Daikon on a grater or in a food processor. Mix with beaten 1 egg, and enough flour, salt and pepper to make a thick pancake-like batter. Drop and flatten out a dollop into hot oil and turn once while browning both sides, or alternatively using a non-stick pan, put in enough oil to allow for browning of fritters, brown both sides and finish them off by baking them in a 350 degree oven for 15 minutes. A little spring onion is nice in this recipe. 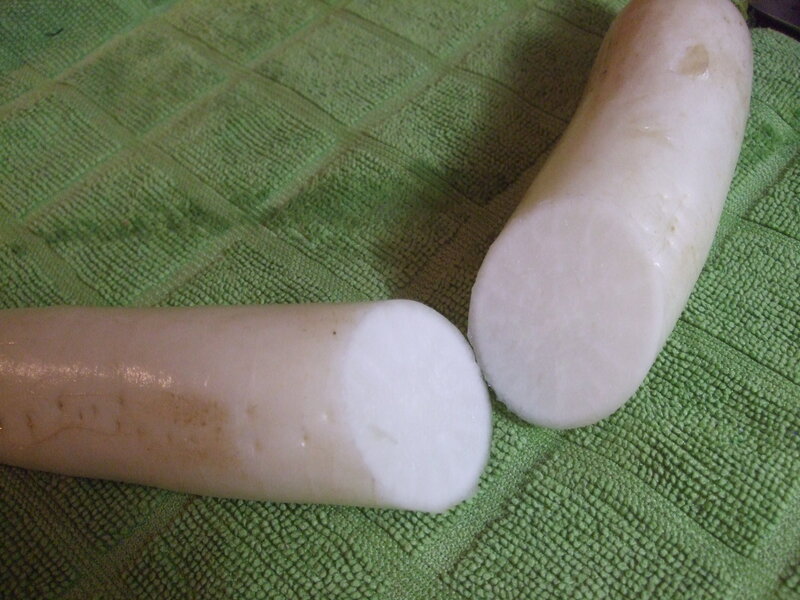 Cut the white root into half-inch slices. Put in a saucepan with one-half to 1-inch of water, depending on how many you’re cooking. Bring to a boil, cover, reduce heat to medium-low and cook for 6-9 minutes. Remove cover. Add soy sauce and simmer for 3 more minutes, or until the root is soft but ﬁrm. Try it. You’ll be pleasantly surprised. Add parboiled chicken bones (or stock), daikon, tomatoes, onions, ginger in a pot and fill with water to submerge the chicken. Add a pinch of turmeric. Turn on heat high and bring to a boil. When boiling, lower heat and simmer for about 20 – 30 minutes till chicken is cooked and daikon turns tender. Add salt to taste. Turn off heat. Add spinach, crushed garlic and cover pot to allow remaining heat to slightly cook the vegetables. A drizzle of sesame oil to taste puts another layer of flavour to this soup. 1 egg, lightly whisked; salt and white pepper. Add a tiny bit of oil to a non-stick pan and when oil is heated, add in green onions and daikon and fry briskly. Allow the daikon to cook (about 5-8 mins) in the pan, moving around in the pan, to prevent strips from sticking together. Add a bit of salt and dash of pepper to the daikon and fry well in the pan. When daikon strips start browning in the pan, add in the whisked egg evenly around the pan, to form a round omelette shape. Wait till the underside of the egg is slightly browned, then flip the egg over, or break the omelette into several big pieces in the pan to get the other sides get cooked evenly and thoroughly). Good for brunch served alongside a fresh salad or toast. Family picnic or any get together where you want something quick and easy that will have everyone coming back for more. This recipe is so refreshing with a sprinkle of cilantro or spring onion on top. 1/2 cup diced yellow bell pepper. Toss all together in a large bowl. Pour dressing over and let stand for 20 minutes before serving. 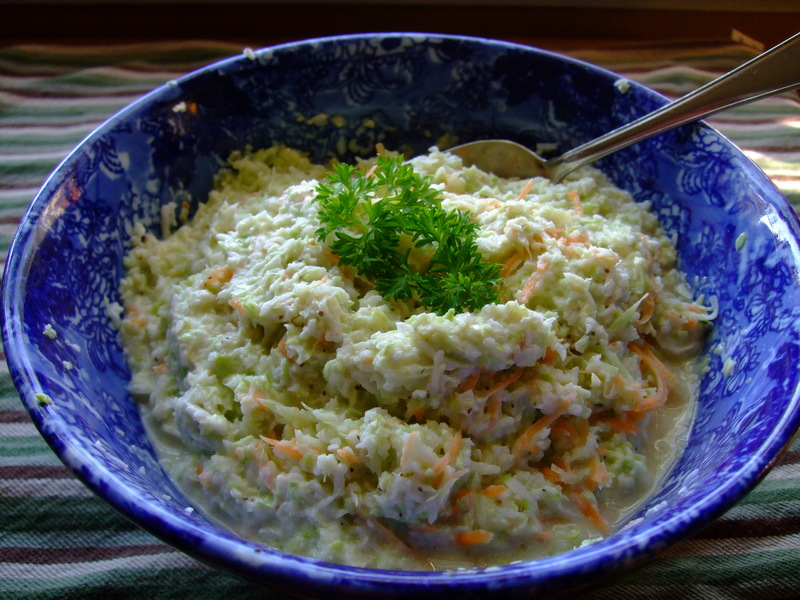 This recipe can be made in a style very close to sauerkraut and served as a side dish or garnish. 2 cups warm water to dissolve sugar. Cut up daikon and carrots, sprinkle with 4 tsp sugar and 2 tsp salt. Mix well about 3 minutes. rinse and strain through a colander. Pack into clean jars and pour pickling juice over top. Seal and refrigerate. Let stand for 24 hours. Will keep for up to 6 weeks. This entry was posted in Uncategorized and tagged Carrots, Cucumber, Daikon Radish, Potatoes, Soup, Sumptuous Salads. Bookmark the permalink.